When a Skirmish match ends in Killzone 2, stats are shown. I’m pretty sure I know what most of the icons mean, but what do the 2 with ??? mean? 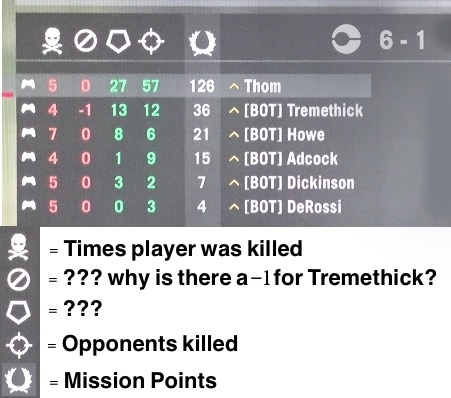 And why does Tremethick have -1 for one of his stats? The pentagon is objective points. In Body Count it's points for kills, in Assassination it's for killing the target or surviving as the target, Capture and Hold it's for killing people in the capture zones, etc. Not the answer you're looking for? Browse other questions tagged killzone-2 or ask your own question.